Hiya guys! Woohoo, TGIF it's time for the weekend. Plans for the next few days include sleeping and lots of mani cave time. Don't I live such an exciting life? Haha. 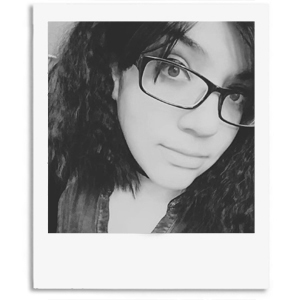 I actually might be heading out to the movies as well, so I'm not a total hermit. But this weekend is mostly about the polish as it always should be and lucky for us there are a ton of fun releases to enjoy. 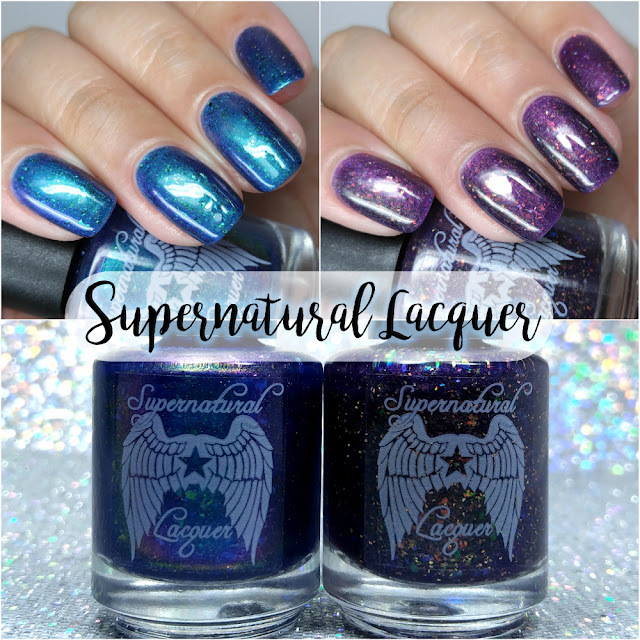 Today I'm super excited to be sharing swatches for the Belated Birthday Box and Cosmic Peacock by Supernatural Lacquer, Let's go ahead and get right into the swatches! 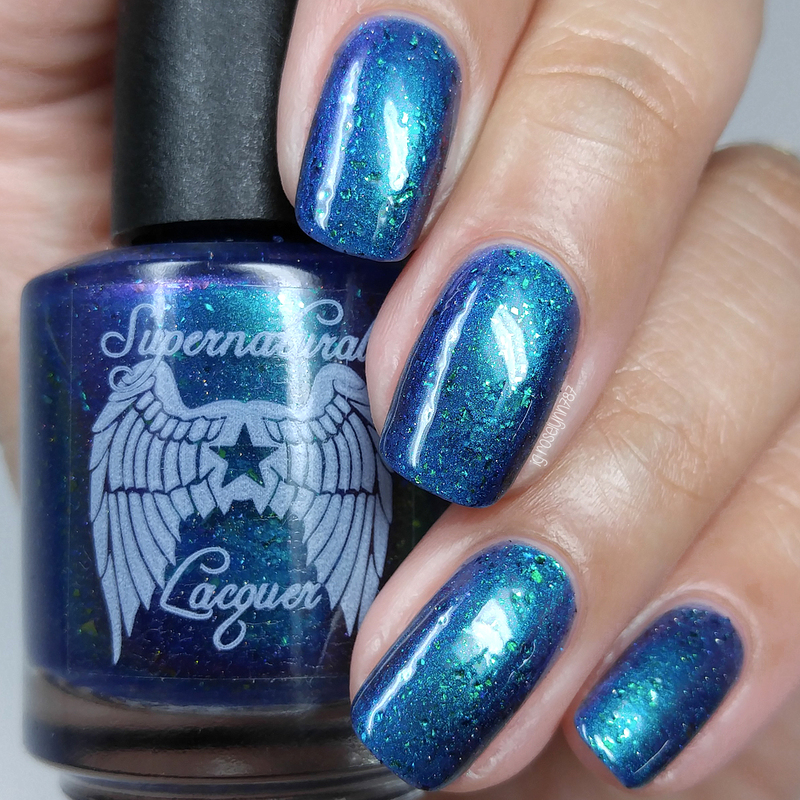 The Belated Birthday Box and Cosmic Peacock by Supernatural Lacquer will be releasing today Friday, June 9th at 9pm EDT for pre-order. Cosmic Peacock will retail in full-size for $12 each. The Birthday Box includes an ombre'd logo coffee mug, a logo crystal stylus pen, and the exclusive polish for $20 (+ shipping). There will only be 70 boxes available with an option to restock later. Cosmic Peacock can be described as a purple leaning blue jelly base with purple/green/blue shifting UCC flakies, blue/green/gold color-shift flakes, purple/green/blue/gold chameleon pigment and holographic pigment. As I mentioned before each bottle retails for $12, but $7 of each bottle will be donated to the Yezidi Emergency Support group to help Yezidi refugees. An amazing polish for a great cause, it's a win win. Shown here in two coats and sealed with a glossy topcoat. Level 30 Achieved can be described as a purple base with a green/purple/red chameleon shift, red/gold/green color shift flakies, gold holo micro flakes and holographic pigment. The formula has a good amount of opacity, but not enough to be a one coater. It dries down to a gritty finish due to all the glitters, but can be smoothed out perfectly with topcoat. Shown here in two coats and sealed with a glossy topcoat. To recap, the Belated Birthday Box and Cosmic Peacock by Supernatural Lacquer will be releasing today Friday, June 9th at 9pm EDT for pre-order. Cosmic Peacock will retail in full-size for $12 each. The Birthday Box includes an ombre'd logo coffee mug, a logo crystal stylus pen, and the exclusive polish for $20 (+ shipping). There will only be 70 boxes available with an option to restock later. Level 30 Achieved is such a stunning polish!